JAIME R. SILVA1, WALTER M. TORRES1 and MANUEL S. ORTIZ2. 1 Departamento de Salud Mental y Psiquiatría, Universidad de La Frontera. 2 Departamento de Psicología, Universidad de La Frontera. Key words: schizophrenia, event related potential, self. Schizophrenia (SCH) is a chronic mental disorder, probably of multifactor origin, characterized by cognitive, affective and social dysfunctions (DSM IV; Friston et al., 1987). In this disease, there is a great deal of evidence with respect to functional and anatomical abnormalities, particularly in the frontotemporal regions and their connections to other brain structures (Woodruff et al., 1997; Sigmundsson et al,. 2001). In schizophrenic patients, múltiple changes have been reported in cognitive functions, for example memory, language, attention span and visual processing (Goldberg & Gold, 2000; Orellana et al., 2006). In this context, personal identity and self-reference, as will be described, also represent a relevant dimensión in the expression of this disease (Bocker et al., 2006; Torres et al., 2007). Although currently the change in personal identity or self is not present on the list of SCH diagnostic criteria, it has been implicitly recognized as an essential component of the clinical symptoms, including in the typical nosography, among the positive as well as the negative symptoms (Bocker et al, 2006; Saas, 2003). Effectively, independent research groups have designated disorders of the self as fundamental to the disease (Saas and Pamas, 2003), proposing new taxonomies (Scharfetter, 1981) and attempting to prove empirically their change based on psychometric (Scharfetter, 1995; Robricht and Priebe, 2004) and neuropsychological (Bocker et al., 2006) tests. Within this framework, it has been reported that patients with SCH have difficulties in processing information related to the self (Gallup et al., 2002; Kircher & David, 2003) and in theory of mind attribution tasks (Corcoran et al., 1995; Frith and Corcoran, 1996), hypothesizing that the latter is secondary to the déficit for the capacity to recognize oneself (Gallup, 1988). Daprati et al. (1997), for example, concluded that schizophrenic patients have difficulty distinguishing between their own hand and that of someone else when it is presented on a televisión screen in real time. Similarly, Kircher and David (2003), in a study with schizophrenic patients, evaluated their ability to recognize their own face, that of a family member and that of a stranger, concluding that in those patients, there was a change in the processing of the self. Finally, studies on subjects with schizotypical personality traits report difficulties in attributing mental states, probably secondary to the change in this same processing (Gallup, 1982; Gallup & Platek, 2002). The stimuli related to processing the self consistently recruit the MLCS, including the dorsal prefrontal and orbitomedial cortices and the anterior and posterior cingulates. Current reports demónstrate a strong relation between the MLCS and self-referential stimuli processing in normal subjects (Northoff et al., 2006; Vogeley et al., 2001) under different experimental task (For a detailed review, see Northoff & Bermphol, 2004). Of interest to this study is the evidence of differential activation of frontomedial brain structures (i.e. anterior cingulated cortex) when the reflection about one's own personality trait is compared to reflection regarding the personality of a well-known public figure (Zysset et al., 2002) or neutral stimuli (Craik et al., 1999). In a recent study, Tucker and Luu (2003) found that the attribution of personal traits (a personality descriptor) produced electric activity in the anterior medial line that does not appear during a simple reading of the same stimulus. It was demonstrated in a source analysis that this condition originated in the anterior and posterior cingulated cortices. Taken together, neurophysiological research suggests the participation of medial line brain structures, particularly frontomedial, in the processes associated with personal image, both conceptual (Tucker et al., 2003) and physical (Kjaer et al., 2002). Although SCH is a disease where the changes in self appear to be highly relevant, it is not known whether there is a neurophysiological or neuroanatomical correlate of this dysfunction. As will be described, the MLCS and their participation in identity processing, probably play an important role in this respect. In contrast to reports on schizophrenic patients regarding changes in attention span, memory (Ford, 1999) and associated psychobiological processes (i.e. P300) (Polich, 1995), there is scant evidence and practically no studies that deal with the abnormalities of the self from a psychophysiological point of view. The conclusive evidence about alterations in P300 amplitude (Jeon and Polich, 2003) and their asymmetric topography (Jeon and Polich, 2001) in these patients suggests that self-referential processing of stimuli may also demónstrate disorders in the brain activation pattern. As presented in the research program in which this study took place (Torres et al., 2007), and as is derived from the evidence in the previous section, MLCS and their role in generating personal identity may present an anatomical and/or physiological pathology in SCH. From the point of view of anatomical abnormalities, numerous studies have reported on this disorder, anomalies in the structure of the prefrontal cortex, the anterior cingulated cortex and the temporal cortex (Woodruff et al., 1997; Sigmundsson et al., 2001) among others; however, there is no evidence exploring the existence of changes in the functions of these structures in self-referential tasks. In order to partially deal with this hypothesis, this study attempts to ascertain the electrophysiological differences between normal subjects and schizophrenic patients in a self-referential task. 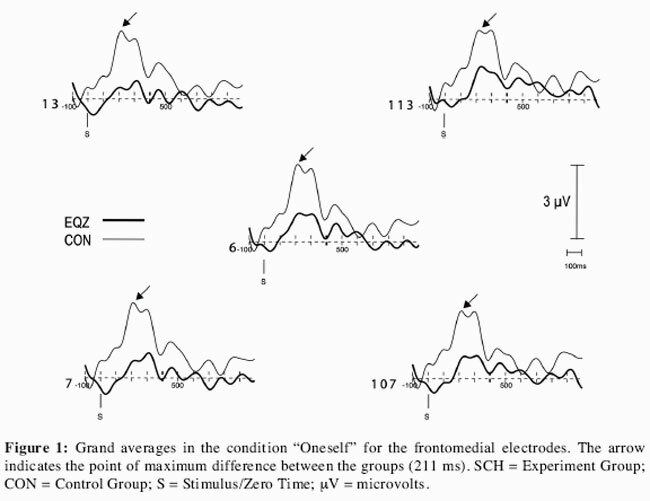 We hypothesize that there are differences between schizophrenic and normal participants in the event related potentials (ERP) amplitude, mainly in fronto medial electrodes, in a personal traits attribution task. This experimental task has been shown to engage frontomedial structures in previous research (Tucker et al., 2003). Once approval had been received from the Scientific Ethics Committee of the Araucanía Sur Health Care Service, the study was explained to each participant, both verbally and in writing, with each signing an informed consent form prior to his or her inclusión. Twelve patients from the Psychiatric Service of the Hospital Dr. Hernán Henríquez in Temuco took part. All the patients were male, right-handed and complied with the criteria of SCH according to the World Health Organization's International Classification of Diseases (10th revisión). The diagnosis was made by a psychiatrist in the Department of Mental Health and Psychiatry from the Universidad de La Frontera. Those with an additional diagnosis of organic brain disorders, mental retardation, drug dependency or who had received electroshock therapy in the last year were not included in the study. All were receiving antipsychotic medication at the time of the experiment. After the procedure, 4 patients were excluded due to a lack of analyzable information because of excessive eye movement or an insufficient number of answers offered in the time required for the experiment. The control group was made up of 10 subjects with no personal or family history of SCH or neurological disorder. After the procedure, 3 subjects were excluded for the same reasons as the experiment group. In both groups, an initial interview was conducted in which general and clinical data were obtained; in the patient group, the interviews were complemented by a review of their clinical records. Each participant was compensated with the equivalent of US$10 in national currency. The characteristics of the schizophrenic and control subjects ultimately included in the study are shown in Table 1. Electroencephalograph: A 128-channel digital electroencephalograph (Geodesics, Eugene, OR) was used with an electrode net that ensures subject comfort and fast application. E-Prime 1.0 software and a 100-MHz Pentium PC were used for stimulus presentation and the response register. Once consent had been obtained and having complied with inclusión criteria, the subjects underwent an experimental task of self (self-referential) I someone known (heteroreferential) personality traits attribution. The list of descriptor words of traits used was that designed by Tucker et al. (2003) and translated into Spanish. In all, 160 words were used: 80 represented a positive trait and the rest a negative trait. The words were presented in 4 blocks of 40 words each for each condition. There were two attribution conditions, one called "self", where the subject had to decide for each attribute presented whether this trait was applicable or not to his "personality". In a second condition called "other", the subject had to answer whether an attribute was applicable or not to a previously defined friend/acquaintance. In a third condition, the subject had to read the word. The order of the conditions was counterbalanced across the subjects. Each trial began with a 2000 ms. fixation point (+) on the screen, then each word was presented for 500 ms and finally 1000 ms. were left for subject response. Each subject performed 10 blocks of trial practice. During the experimental procedure, a continuous EEG was obtained with impedance kept below 50 KQ, using a sample of 250 Hz and a pass band filter of 0.1 - 100 Hz. The ERP were obtained offline by averaging all the assays of a given condition. The segmentation was performed for each trial considering the stimulus presentation, 100 ms before and 1000 ms. after. Subsequently, EEG grand averages were obtained to emphasize the EEG patterns shared by all the subjects of a group or condition. To achieve this, we began by filtering the continuous EEG record with a pass band of 1 - 9 Hz. Then, the filtered register was segmented into categories according to experimental conditions of interest ("Oneself", "Other", "Reading"). To automatically detect the artifact contained in the segments obtained, the artifact detection algorithm of the Netstation 4.0 program was used. The following criteria were adhered to for detecting erroneous segments: Máximum Number of Bad Channels (Máximum 10 bad channels); Blink Threshold (70 ¡xV) and Eye Movement Threshold (70 |xV). Then, an eye inspection was performed over the results and those segments with artifact were eliminated. Once the corresponding segments were obtained and taking into account the high number of available channels (128), those channels with incorrect registrations were replaced. The non-rejected segments were immediately averaged for each category created during the segmentation (self, other and reading). The data obtained were referred to the average and corrected for the polar average reference effect (Junghoefer et al., 1999). Then, the ERP grand averages were obtained among the categories for the subject groups, with a baseline correction finally being performed, subtracting the record average of 100 ms prior to beginning stimulus. The ERP grand averages were inspected visually for each condition and group in the electrodes of interest, as well as the resulting topographical maps, with these latter being processed in animations of the progression of voltage variations in the electroencephalographic register. In addition, based on the amplitude variations observed in the grand averages, the statistical differences of the adaptive media of the brain voltage variations were analyzed in the time windows: 180-230 ms, 310-380 ms and 415-490 for frontomedial electrodes (6, 13, 113, 7 and 107), Fpl, Fp2 and Cz; and 75-175 ms for electrodes P3, P4,01and02. Múltiple analyses were performed on the average variations (adaptive mean) of the brain voltage in the montage of the electrodes selected and in the time windows of interest. Due to space limitations, only the most relevant results are reported. A repeated measures ANOVA with a between-subjects factor (SCH and normal) and a within-subject factor (self and other) was performed on the adaptive means for the 180-230 ms time window in the frontomedial electrodes, with a group effect (F=5.352; p=0.038) being found. 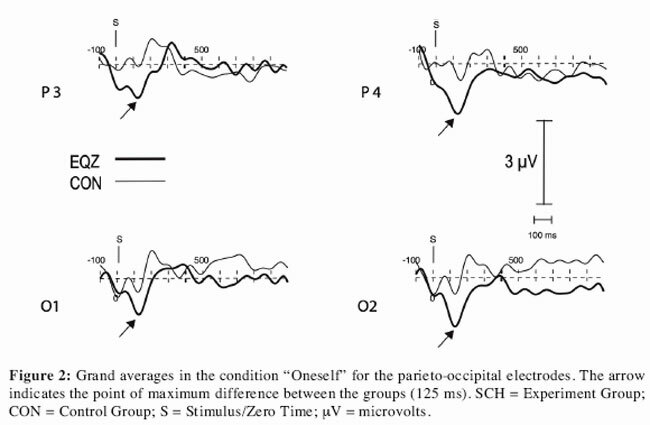 Comparisons of the differences between the groups show that the schizophrenics presented less voltage in the condition self (t=2.386; p=0.033) in the frontomedial electrodes, whereas for the condition other, this difference was not statistically significant (t= 1.971; p=0.07) although it did go in the direction expected (Fig. 1). Similarly, a repeated measures ANOVA with a between-subject factor (SCH and normal) and a within-subject (self and other) were performed on the adaptive means for the 75-175 ms time window on the parieto-occipital electrodes, with no significant effects being found. In an exploratory analysis, a difference was observed in the direction expected for electrodes P3 and P4, but it was not statistically significant (T=1.833,p=0.9)(Fig.2). The results confirm in part the initial hypothesis. When the cortical activity related to self-reference in normal subjects is compared to that of schizophrenic patients, the latter present a distinct electrophysiological pattern in the frontomedial áreas of the scalp, however in a temporal window not consistent with the hypothesis. Specifically, in experimental conditions for self-reference, schizophrenics show significantly less amplitude than normal participants, in the frontomedial electrodes in the 180-230 ms time window (211 ms point of máximum average difference). This relation is also outlined in the condition of trait attribution of another person, in which schizophrenic subjects present less amplitude in the frontomedial electrodes in the same time window, although there is no statistical significance. In the same way, the topopgraphy of voltage variations in the condition self and other present greater posterior activity (parieto-occipital electrodes) in SCH, although this difference is also not statistically significant. First, several studies have shown that frontomedial activity induced during self-referential tasks typically emerge in late potentials (i.e. posterior to 400 ms). In the present study, although frontomedial differences between the groups were observed, these differences emerge in a early temporal window. For this reason, the results are not proof of the hypothesis and must be interpreted with caution Given that frontolimbic brain structures have been recently related to personal identity (Noerthoff et al., 2006; Kircher et al., 2000; Northoff & Bremphol, 2004; Tucker et al., 2003; Kjaer et al., 2002) and more generically to the regulation of motivated action (Luu & Tucker, 2004) as well as to the evaluation of significant events (Luu et al., 200), it is possible to suggest that the early modulation of the word-related meaning creation in a self-referential context could be affected in SCH. On the other hand, considering that P200 is often considered a pre-lexic component (Brown et al., 1999), in the context of this investigation it could indicate instead a problem in the early visual processing of verbal stimuli. It must be pointed out that studies along these lines have not found any differences in SCH in this component (Niznikiewicz et al., 1997), suggesting that the experimental condition of self-reference may still be playing a significant role in the modulation of P200. This dilemma is an interesting aspect for fu ture research. There are additional limitations of the study. In the first place, the small sample of subjects, although similar to other international studieson the psychophysiology of SCH, prevenís generalizations on the conclusions reached. Similarly, as only one type of SCH was included, the findings cannot be extrapolated to other forms of the disease. Although the topography of the voltage variations observed in the experimental tasks of interest is in agreement with frontomedial cortical activity, this does not guarantee such a relation. This is why part of our future objectives is the implementation of appropriate analyses (Le., source analysis) for establishing such an affirmation with greater certainty (study in process). Finally, even when the experimental conditions were controlled and the results congruous with current scientific evidence, the possibility cannot be excluded that the differences found in the study were due to a generic change in the visual perception system, as has been demonstrated in other lines of investigation (Pottsetal.,2002). This research was financing by Universidad de La Frontera, Proyecto DIUFRO N° 110607. Correspondence to: Walter M. Torres Cáceres, Dpto. Salud Mental Psiquiatría, Facultad de Medicina, Universidad de La Frontera, Montt 117, Temuco, Región de la Araucanía, E-mail: wtorres@ufro.cl, Fono: (45) 325736. Received: April 13, 2007. In Revised form: May 9, 2008. Accepted: May 30, 2008.